Following Vonns post I’d like to share this story. The following is feedback I got on two of my knives. Not as glamorous as Vonn’s but feedback non the less. My daughters are 12 and 15. I allowed the older girl to choose, and she chose the black burlap one from this sale thread. The younger girl gets the brown one. Work has been super busy and I haven't had much of a summer. The knives haven't gotten the miles on them I expected or hoped they would. But I did finally get outside for a spell. Over Labor Day, I was in northern California the great state of Jefferson for a few days of camping in Mad River. I could not bring the girls but I brought their knives. We had a fire pit and a charcoal grill but nonetheless I did some fire prep and made coffee on my new Scout stove, as an excuse to try out the knives (and the stove). Iscrounged some very dry fir, a hunk of 180 proof fatwood, and a length of madrone for a baton. If you haven't heard of madrone, it is a hardwood that grows along most of the west coast; from San Diego to BC. It is so hard, in fact, that early Mexican vaqueros carved spurs out of madrone. It is a great cooking wood that imparts a flavor similar to mesquite. I was only making coffee so it would have been a waste to burn it up for that. I meant to bring a few logs back to Washington with me but I forgot to toss em in the truck. Anyway -- I went back and forth between the two knives; making shavings, carving stuff and batoning short pieces of fir. I have to say, even though the two knives look like exactly the same profile, they felt pretty much identical in the hand. Just enough grip length for my M/L hands, and perfect for my daughters' hands; now and at anyage. I spent an hour or more carving feathers/shavings and whatnot from the tough old dry firewood I had collected. I wish I'd taken more pictures. Now, my own small knife (5col backpacker) has jimping on the spine, so I got into the habit of using my thumb on the spine to control the blade for some carving. I had to unlearn that habit. These knives have a nice, sharp 90 degree spine for ferro rods or fine shavings, but the tradeoff is the potential for blisters. Honestly I don't think it would be a problem with any sort of softer/greener wood. Or for folks who haven't learned the same knife habits as me. The good news is that in this area (and especially this time of year) there is no shortage of dry tinder without needing to make shavings. 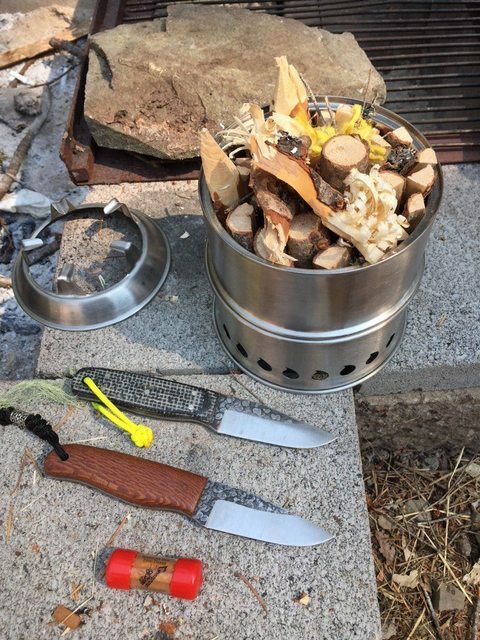 I just wanted to see how the knives handled things, and as it turned out, they are fine tools for fire prep and general usage. I loaded up my stove and took a picture. See anything wrong? It's worse than it looks. What you can't see very well in the above image is the triple handful of pine twigs shaken down into the fuel wood. I had too much wood in the stove for good airflow. Bah. Hindsight's 20/20, that's what them YouTube experts did, etc. But still. New stove, new thing to learn. After I took out a couple three pieces, added a few slivers of fatwood and hit it with a spark, the stove took off like gangbusters. So now I know better. And I'm impressed. Made me some cowboy coffee from my brother's freshly roasted beans (mix of Burundi and Guatemalan). I forgot to let the water cool and pretty much RUINED the coffee. But it was still better than any coffee I paid for. But that's another story, as is the new stove. The star of THIS story is the two Hiking Buddy knives. They are great tools. My brother (USMC, Recon, survival instructor etc.) tried them out and now he wants one too. Each of my daughters gets their own individual tool (and matching sheath) but of equally high quality. Next up, I will sit down with my kiddoswith some easy carving wood and do try sticks. No idea when, but it will happen. My girls need to work with their knives and make them their own. I really enjoyed using these knives, and am delighted that I can present them to my daughters. Thank you, @Bartonceek, for making theseawesome knives. I can't see the pictures for some reason. I see them on my end. I’ll see if I can post up some pictures. No big deal I'm sure they look great! I see them, and they look great. Nice knives, nice pictures, nice day "out"
No pictures here either and after that report I will be coming back to the thread untill I see them. This brings up an interesting point as I leave the spine on the bushcraft hunter square (and others when I am asked to) for the same reason but after reading what you have said I think I am going to start rounding the spine or at east easing the edges for the first inch and then have the 90 degree spine for fire tool use. Most I have seen using the firs steel seem to use the spine about two thirds of the bade length to strike with so easing the edges for the first inch will make for more suitable use when carving and suchlike as you were doing with yours. These were actually purchased by a fellow out west for his two daughters. These are the two knives that I received feedback on. That patina you do looks wonderful and I love how it matches the scales in the top knife in the pic. Nice knives, and wonderful story! Although, I’ve never really thought of Madrone as being all that hard. When I wanted an extremely HARD wood to use for for some scales, I chose Lignum Vitae. Now that is HARD! Madrone, at around 1450 lbf Janka, it’s right around Hard Maple. Just found it interesting. Thank you. I really don’t know much about that wood. Only what was posted.